P0107 Atmospheric pressure sensor Output from the atmospheric pressure sensor is too low. P0108 Atmospheric pressure sensor Output from the atmospheric pressure sensor is too high. P0112 Intake air temperature sensor Output from the intake air temperature sensor is too low. P0113 Intake air temperature sensor Output from the intake air temperature sensor is too high. P0117 Coolant temperature sensor Output from the coolant temperature sensor is too low. P0118 Coolant temperature sensor Output from the coolant temperature sensor is too high. 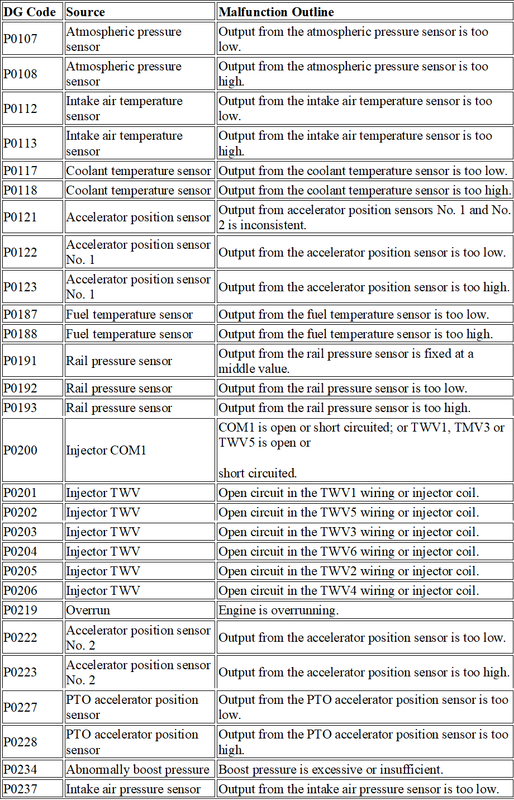 P0121 Accelerator position sensor Output from accelerator position sensors No. 1 and No. 2 is inconsistent. P0122 Accelerator position sensor No. 1 Output from the accelerator position sensor is too low. P0123 Accelerator position sensor No. 1 Output from the accelerator position sensor is too high. P0187 Fuel temperature sensor Output from the fuel temperature sensor is too low. P0188 Fuel temperature sensor Output from the fuel temperature sensor is too high. P0191 Rail pressure sensor Output from the rail pressure sensor is fixed at a middle value. P0192 Rail pressure sensor Output from the rail pressure sensor is too low. P0193 Rail pressure sensor Output from the rail pressure sensor is too high. P0201 Injector TWV Open circuit in the TWV1 wiring or injector coil. P0202 Injector TWV Open circuit in the TWV5 wiring or injector coil. P0203 Injector TWV Open circuit in the TWV3 wiring or injector coil. P0204 Injector TWV Open circuit in the TWV6 wiring or injector coil. P0205 Injector TWV Open circuit in the TWV2 wiring or injector coil. P0206 Injector TWV Open circuit in the TWV4 wiring or injector coil. P0219 Overrun Engine is overrunning. P0222 Accelerator position sensor No. 2 Output from the accelerator position sensor is too low. P0223 Accelerator position sensor No. 2 Output from the accelerator position sensor is too high. P0227 PTO accelerator position sensor Output from the PTO accelerator position sensor is too low. P0228 PTO accelerator position sensor Output from the PTO accelerator position sensor is too high. 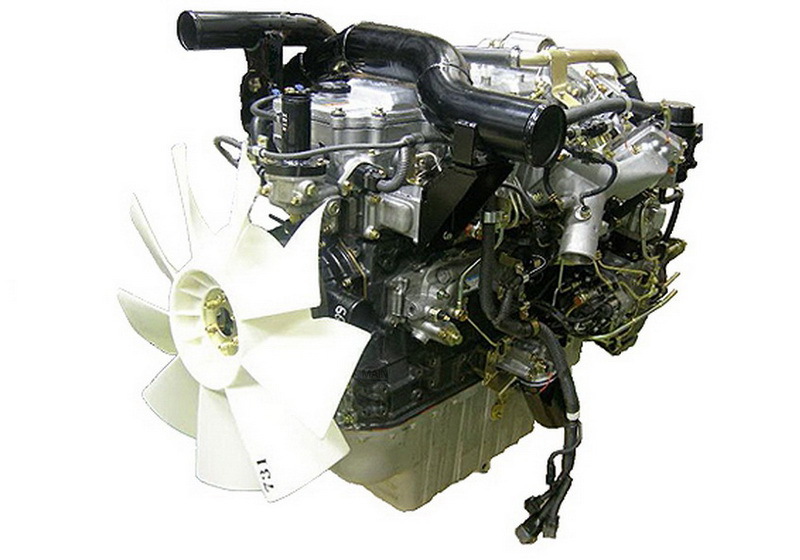 P0234 Abnormally boost pressure Boost pressure is excessive or insufficient. P0237 Intake air pressure sensor Output from the intake air pressure sensor is too low. P0238 Intake air pressure sensor Output from the intake air pressure sensor is too high. P0251 Fuel leak Fuel leak in the injection system or fuel system. P0252 Pressure limiter Pressure limiter is operating. P0253 Abnormally high pressure 2 Output from the rail pressure sensor is over the higher upper limit. P0254 Abnormally high pressure 1 Output from the rail pressure sensor is over the lower upper limit. P0257 Supply pump Poor pumping in the supply pump No. 1 cylinder. P0335 Engine speed sensor No signal output from the engine speed sensor. P0340 TDC sensor No signal output from the TDC sensor. P0506 IMC volume IMC volume signal is too low. P0507 IMC volume IMC volume signal is too high. P0510 IDLE switch IDLE switch is seized closed. 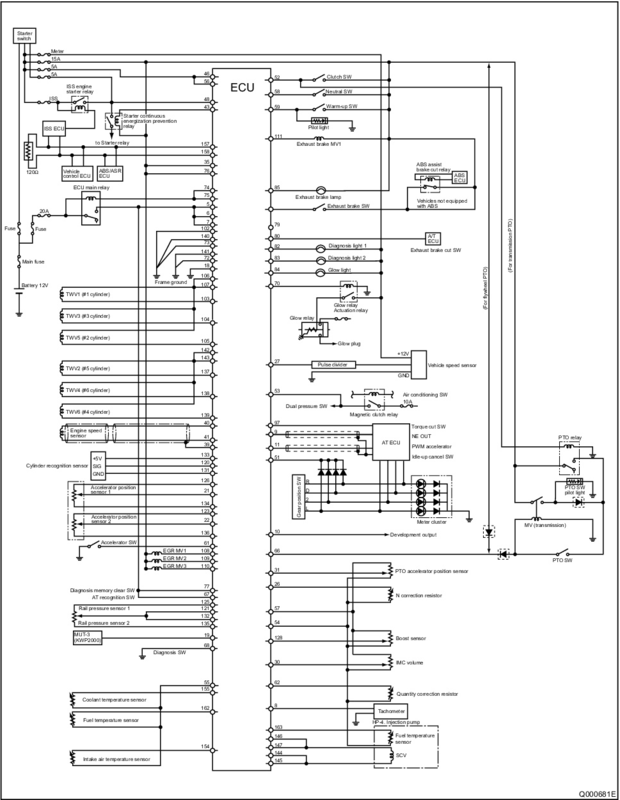 engine ECU or vehicle speed sensor. P0605 CPU (in the engine ECU) Main CPU malfunction or watchdog malfunction. P0616 Starter prohibition relay BATT short in the output to the starter prohibition relay. P1121 Intake throttle valve Open circuit, GND short or BATT short in the output to valve MV1. P1171 Injection correction resistance value Injection correction resistance value is too low. P1172 Injection correction resistance value Injection correction resistance value is too high. P1176 Maximum speed adjusting resistor Adjusting resistor value is too low. P1177 Maximum speed adjusting resistor Adjusting resistor value is too high. P1185 Engine stop switch Engine stop switch is seized closed. P1240 Fuel system 1 Large momentary fluctuations in No. 1 cylinder speed. P1241 Fuel system 5 Large momentary fluctuations in No. 5 cylinder speed. P1242 Fuel system 3 Large momentary fluctuations in No. 3 cylinder speed. P1243 Fuel system 6 Large momentary fluctuations in No. 6 cylinder speed. P1244 Fuel system 2 Large momentary fluctuations in No. 2 cylinder speed. P1245 Fuel system 4 Large momentary fluctuations in No. 4 cylinder speed. open circuit in SCV coil. P1256 Output to SCV BATT short in ECU terminal SCV+ or SCV-. P1262 Exhaust brake MV1 Open circuit or GND short in the output to MV1. P1263 Exhaust brake MV1 BATT short in the output to MV1. P1605 ECU Malfunction in the flash memory.